Sri Aurobindo (1872—1950) is one of the bright stars of the modern Indian firmament who has left behind him a legacy, a philosophy and an institution. Born on the 15th August 1872 as the last son of Dr. Krishna Dhan Ghosh and Swarnalata Devi at Konnagar of West Bengal, he had his early education at the Loretto Convent School of Darjeeling. After two years, in 1879, he was taken, along with his two elder brothers, to England for further education. He lived there for 14 years, his early coaching being under Mr. and Mrs. Drewett. He had his higher education at the St. Paul’s School of London and King’s College at Cambridge. He became an adept not only in English but also in the classical European languages like Greek and Latin, as also French, Italian and German. Though he passed the open competition for the Indian Civil Service (I. C. S.) in 1890, he failed to complete it since he felt no call for it. During this period he had already become well acquainted with the political upheaval in India as also the atrocities of the alien British government on the Indians. Returning to India in 1893 he accep-ted service under the Maharaja of Baroda in which he continued till 1906, one year after the partition of Bengal. All along he had kept in touch with the political movement and had proved to be a source of inspiration for the young revolution-aries. His writings in the papers like the Jugantar, Induprakāśa and Bande Mātaram being of a highly provocative nature, attracted the evil eye of the British government. His call for boycotting the foreign goods, substituting national schools for the government institutions, creation of arbitration courts for people and attempts at forming the nucleus of a national army added to his problems with the government. He was finally arrested in 1908 in what is now well-known as the Māṇiktala Bomb Case and was in jail for a year, before being acquitted. Right from 1904 he had been taking deep interest in the practice of yoga. In 1908 he received some help and guidance from Sri Lele, a Mahratta Yogi. While in jail, he has stated, that he had some mystic experiences like hearing the voice of Vivekananda instructing him on some aspects of yoga. He started two weeklies, Karmayogin (in English) and Dharma (in Bengali) which had a fairly large circulation. Meanwhile his association with politics including the Indian National Congress continued. However, a strong inner urge made him take a sudden decision to depart for Chandernagore, a French settlement, leaving the editing of the Karmayogin in the hands of Sister Nivedita, with whom he had a very close acquaintance. He later shifted to Pondicherry in 1910 where he lived till he breathed his last, on the 5th December, 1950. In Pondicherry he totally dedicated himself to yogasādhanā and guiding the earnest souls that started gathering round him. Thus, in course of time, an Ashrama grew around him. Mrs. Mira Richards, a French admirer, later known as the Mother, who had come into contact with him in 1914, started living there and took over the management of the Ashrama by 1922. 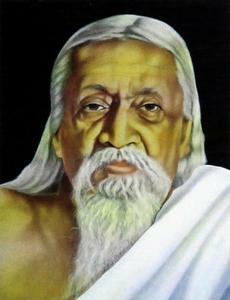 Sri Aurobindo was a prolific writer too. Sāvitrī, a long poem of 24,000 lines in blank verse, is his magnum opus. He has delineated his philosophy in another great work, The Life Divine. Essays on the Gītā, The Synthesis of Yoga and The Secret of the Vedas are some of his other notable works. His teaching is that behind the appearances of the universe, there is the Reality of a Being and Consciousness, the Self of all beings and things. This Being is involved here in matter. Evolution is the method by which it liberates itself. Life is the first step of this release of consciousness. Mind is the second. The next step of evolution must be towards the development of Supermind and Spirit as the dominant power in the conscious being. Man has to exert himself consciously to evolve to this level. The ancient psychological discipline and practice of yoga is the method. This will help the descent of the higher, supernatural, principle into the mind. Then the One Self is discovered in all and the supramental consciousness transforms and divinises the human nature.